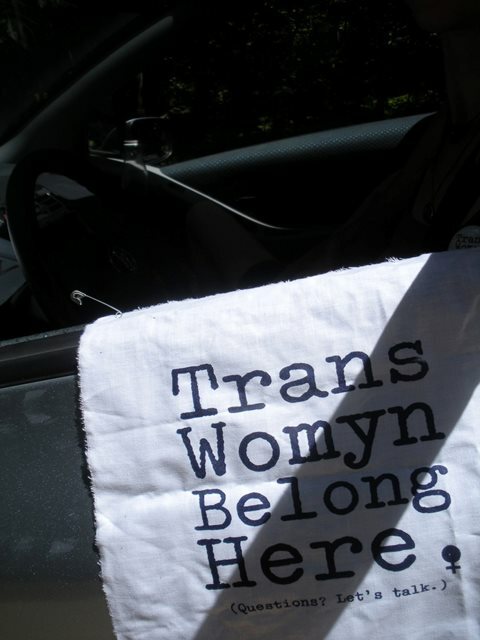 MichFest attendees who support the inclusion of trans women’s hang a sign from their car door. Photo by Sarah Ditson. Editor’s note: This is part three of three in a series on maintaining a sense of community. Click for part I and part II. The modern queer community often prides itself on being an inclusive, welcoming space; however, in both historical and contemporary contexts, queer spaces often have clear signifiers of who is welcome as a member and who is not. As issues of diversity and inclusivity become yet more pressing — and as traditional dichotomies between identities give forth to spectrums — the response of a given community to the challenge of including those who may not fit the “standard model and mode” of membership can become divisive. Traditionally segregated spaces such as the Michigan Womyn’s Music Festival and gay men’s bathhouses create their own guidelines for who is “in” and who is “out” when it comes to membership; considering the ways that these guidelines are formed and evolve illuminate key truths about group membership and inclusion, and can serve as models for the formation of truly diverse queer society. While not an explicitly or exclusively queer space, the Michigan Womyn’s Music Festival has become a pilgrimage site of sorts for lesbian, bisexual, and queer women since its inception in 1976. This March, trans lesbian activist Red Durkin created a petition calling for performers to boycott the festival until it end its “don’t ask, don’t tell” stance and welcomes all self-identified women. Christine Masseey, a Portland trans woman who has not attended the festival, acknowledges that cis women and trans women have different life experiences but doesn’t see MichFest actually engaging with those differences. Some festival attendees have expressed concern that trans women threaten not only the intention but the safety of the space — an argument many trans activists and allies say stems from an unwillingness to accept trans women as women. Durkin pushes back against the idea that the presence of trans women compromises the safety of cis women. (Trans women already attend the festival in limited numbers. Read about trans activist Jenn Burleton’s experiences performing at MichFest on page 29). “The reality is that Michigan Womyn’s Music Festival is not safe for any women until it is welcoming for all women,” Durkin writes in the petition. Freddie Perry, a one-time MichFest attendee who found the experience transformational, rejects the WBW policy. Rather than existing to honor a specific experience of womanhood, Perry says, the policy is based on fear and ignorance. Three-time festie Sarah Ditson, who has advocated for the inclusion of trans women at MichFest but has decided not to attend in the future, says the festival is stuck in the past. While a number of performers have either pulled out of the 2013 festival or vowed not to perform future fests until the WBW policy changes, it is unclear if or when the Michigan Womyn’s Music Festival will join the growing number of women-only spaces that accept and affirm trans women. The bathhouse serves as an inclusive, unified community with a clear barrier between it and the larger society. Photo by Humon Photography, courtesy of Hawks PDX. The bathhouse has historically been a clearly-defined gay male community space — and while it is a closed community with distinctive social signifiers, the space often succeeds in opening itself up to a surprising level of diversity. Since the 1500s, bathhouses have been key centers of gay male social and political life; since the 1950s in particular, many have run programs such as voter registration drives, and others offered special programs on holidays like Christmas and Thanksgiving for men who found themselves alienated from their families. Non-sexual entertainment also blossomed within the bathhouse environment; performers such as George and Ira Gershwin (who themselves owned a bathhouse) and later Bette Midler were known to perform for the men assembled. One significant way bathhouses are able to create a unified community of their membership is through clothing — or, more accurately, the lack thereof. In the 1979 ethnography “Homosexualities,” Kinsey Institute researchers Alan Bell and Martin Weinberg comment on how the sartorial mores of the bathhouse unify its members. This radical dismantling of men’s social veneer — rendering them separate from both their day-to-day clothed personae as well as the larger world of “men without towels” — enabled the bathhouse to be an inclusive, unified community with a clear barrier between it and the larger society. Bathhouses were, and are, a space for gay men; however, many in the community now understand that some gay men may not be assigned male at birth, or even present in a way that reads to others as male, while cisgender men may also present as women. While it is rare for bathhouses to create official policies excluding those who present (or identify) as women — in most jurisdictions, this would constitute illegal discrimination — policing through social exclusion by patrons often enforces that the bathhouses are not places for those who are female presenting or identified. Gay-identified trans men, on the other hand, are welcome within bathhouses. In a recent interview with PQ, Hawks PDX manager Derek Garduno was emphatic that his bathhouse was indeed open to all male-identified people.